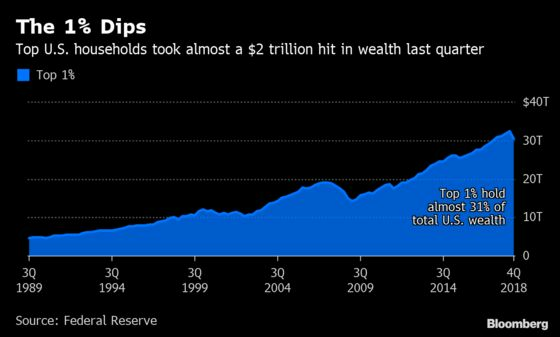 (Bloomberg) -- The top 1 percent of U.S. households took a $2.3 trillion hit from the plunge in corporate equities and mutual fund shares in the fourth quarter of 2018, according to the Federal Reserve. Newly released data provides quarterly distributions of U.S. household wealth by category: the top 1 percent, top 40, top 90 and the bottom 50 percent, since 1989. A wide variety of account types are included. While the top 1 percent experienced a drop in wealth from the decline of equity holdings, some of the drop was counter-balanced by gains in municipal securities and other debt instruments, increased deposits in checking accounts, real estate gains and other holdings. The overall drop in wealth for the top 1 percent was $1.9 trillion -- roughly equivalent to the GDP of Italy. Since the last quarter of 2013, the top 1 percent of households have held greater than a 30 percent share of U.S. household wealth. The Fed intends to update the database quarterly.